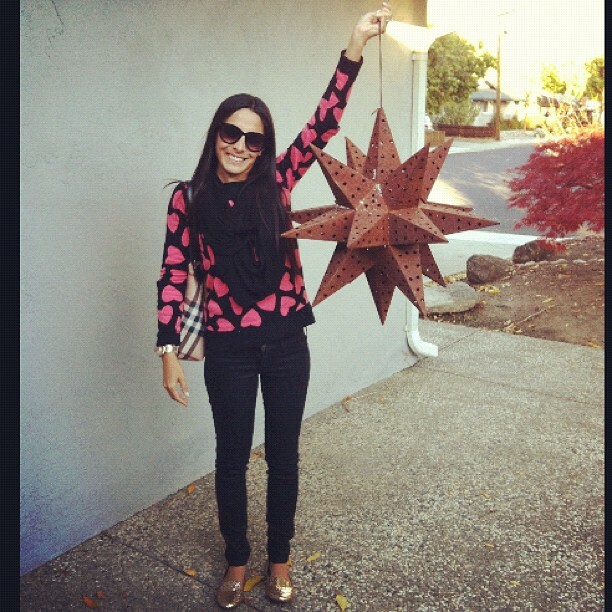 A few months back, my birthday to be exact, I came across this punched metal star on the side of the road. 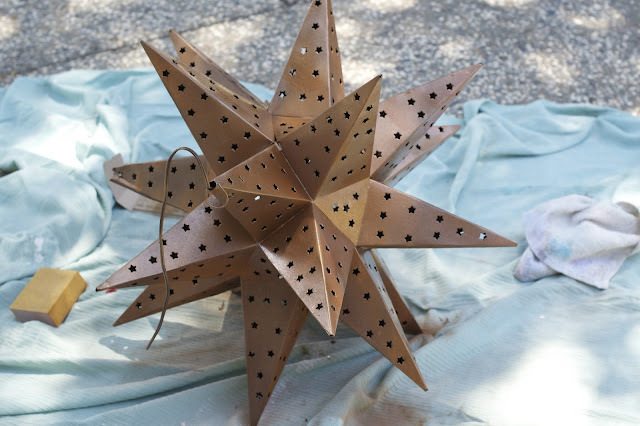 The star was completely covered in rust, spider webs, and a fake snow from the Christmas tree lot, but I knew it had such beautiful potential and just needed a little love. 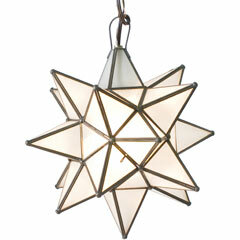 Pictured below was a star I had originally intended to save up for to hang in our bedroom. Needless to say, I was overjoyed to find a free one that just needed a bit of work. I saw it as a little birthday luck! 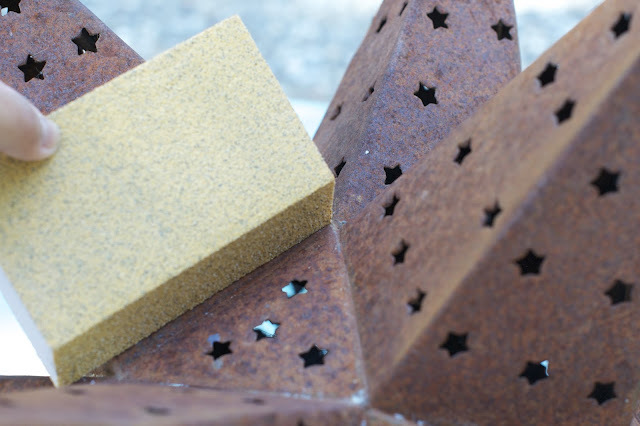 The sandpaper brick was a huge help for the million corners and points on the star. Next, I sprayed the first layer. 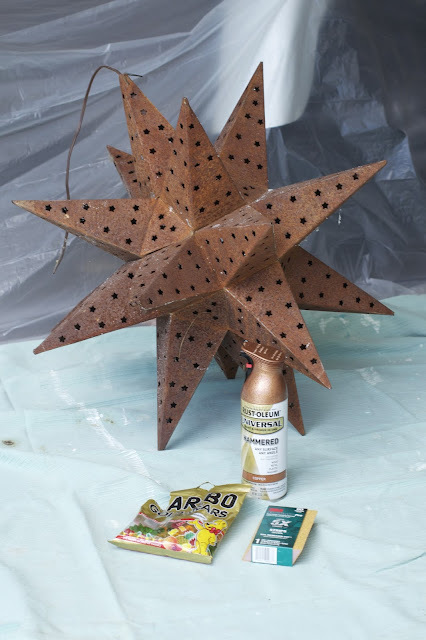 I kept the spray paint about a foot back doing a light misting motion, making sure to hit all the corners and edges without applying too thick of a paint layer. When spray painting, patience is the best tip! Doing it too quickly can result in a patchy paint job or even worse- drip marks! I waited about an hour then applied another paint layer. I also spray painted a random chain we had from a different chandelier to use to hang the star. Finished! 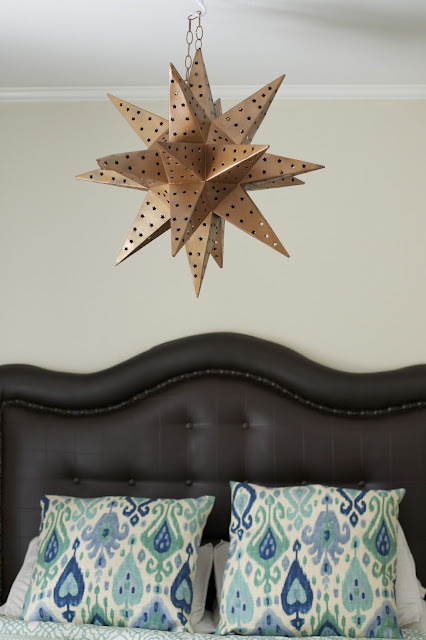 The beautiful metallic star was the perfect addition to our bedroom. 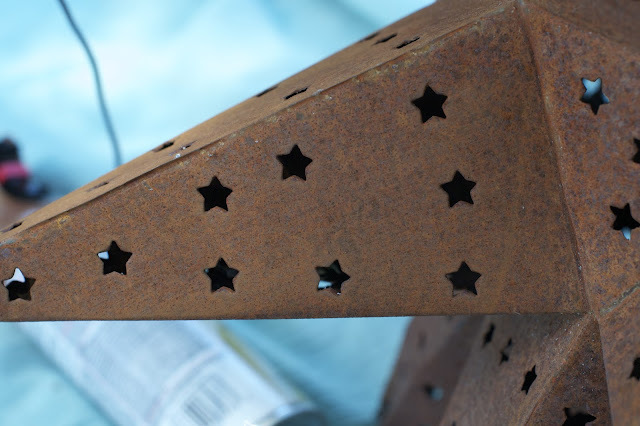 Best part- this project cost less than $10! Very cute! I probably would have painted it white and then painted the edges darker to make it look more like the one you wanted, but I always over think craft time...AND your version matches your rug perfectly!! I think that you found one of those rare "trash-to-treasure" pieces! Do you think it was junked from the Christmas tree lot? I'm always on the lookout for those types of pieces- nice job! There was actually a Mexican restaurant that had it as decor and stored it in a barn with Christmas trees in it. I've actually been to places before and if I enjoy their decor, most times I'll ask if they have any spare items or old items they would be willing to sell. It doesn't hurt to ask and they're usually flattered you like their decor so much. More home tour!! 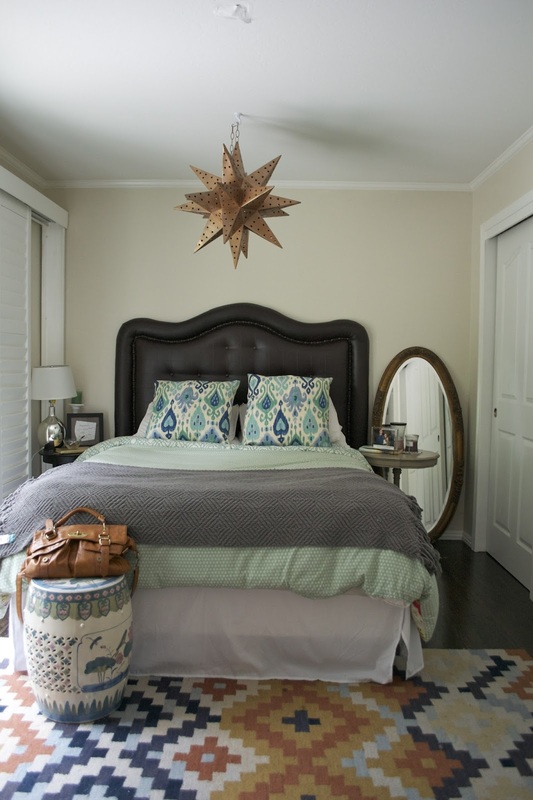 LOVE your bedroom! I totally wish I had that eye to take something old and make it amazing! 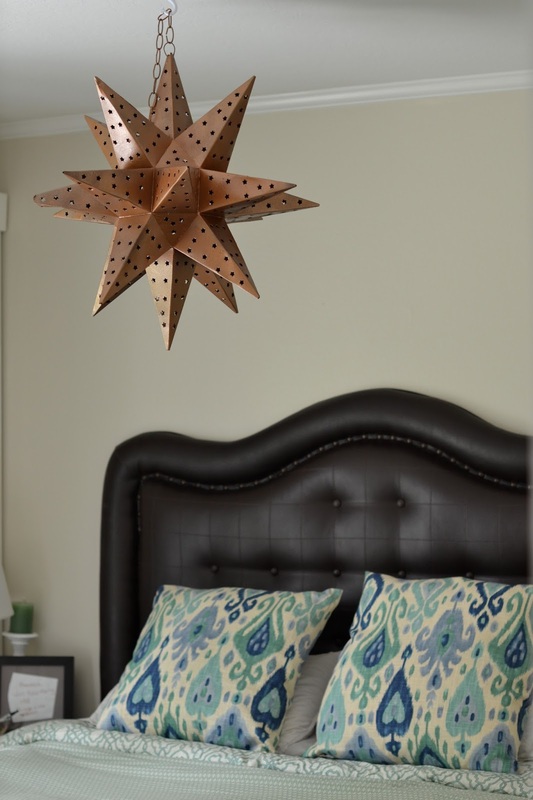 This is an awesome project, and I'm totally loving how you've decorated your bedroom! It's so funny you said that! My mom was like, "wow that looks scary! Hope it doesn't fall!" The lamp is actually set up closer to the foot of the bed. So if it fell, it would hit our legs. Ouch! Where did you find that fabulous rug?